American Cocker Spaniel Bird House for the dog lover from our favorite woodcarver! 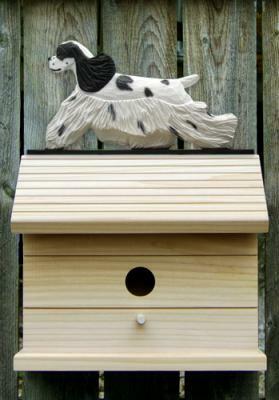 Dog Lovers - combine your love for dogs and birds together with our Dog in Gait American Cocker Spaniel Bird House. Bird Houses are made of Western Red Cedar and feature a hand painted American Cocker Spaniel 2 dimensional figure mounted on the peak. The Bird House measures 11 1/2" x 7" X 10" and the Hand painted American Cocker Spaniel measures approximately 11 1/2" in length (depending on breed). The American Cocker Spaniel Bird House can be mounted on a fence, side of a building, tree. The wood on these bird houses will turn a beautiful shade of grey as it weathers. Made in USA.